In New Orleans 1930s, the Crescent City; There is an armed standoff between Louisiana State Troopers and New Orleans Police; An art swindle that may end in murder; A dead man who may not be; Smugglers working the Bayou; And someone wants Jonas dead. Jonas Watcher arrives to determine if Martin Stanton is really dead. Someone is tailing him to make sure he doesn't find out. The investigation takes him from the French Quarter to its surrounding Bayou where he discovers that all the criminals aren’t in the city and not all the reptiles in the Bayou are on four legs. If he's going to stay alive, Jason will have to rely on “invisibles” that aren't his own and a Colt 44 that is. 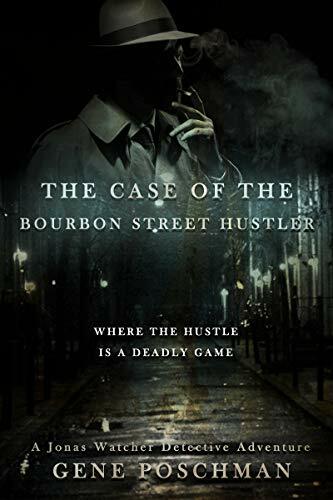 “The Case of the Bourbon Street Hustler” is the second novel in the Jonas Watcher Detective Adventure series. Martin Stanton is dead. As dead as a coffin nail, isn't he? It is detective noir at it's best as Gene Poschman, takes Jonas out of his element and drops him into the Crescent City during political turmoil between New Orleans police and Baton Rouge troopers. He mixes in an old love interest, the New Orleans underworld, and friends from San Francisco for a heady brew of murder, mystery, and mayhem. Take a journey back to the 1930s New Orleans. There's Jazz and Blues in the French Quarter. New Orleans Police hold off Baton Rouge troopers in the Bayou. And on the docks by the River, an art swindle gone wrong, leads to a deadly fight on the docks.